After receiving feedback from University of Notre Dame students and others on campus, Student Government, Campus Dining and Student Activities have selected Star Ginger Asian Grill and Noodle Bar, Modern Market and a coffeehouse featuring Intelligentsia coffee as the inaugural dining options for the new Duncan Student Center. 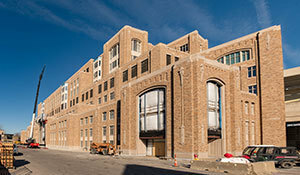 Located on the west side of Notre Dame Stadium, Duncan Student Center will open in January 2018. Star Ginger Asian Grill and Noodle Bar is the creation of Chef Mai Pham and offers simple dishes inspired by Asian street food and flavors from Thailand, Vietnam and Singapore. Lunchtime offerings include noodle soups, salads, salad rolls, wok-fried rice noodles and toasted Vietnamese sandwiches. At dinner, guests can enjoy specialties like Thai curries, stir-fries, grilled meats and fish and vegetarian options. Created by two Notre Dame graduates, Modern Market’s mission is “To serve amazing, healthy food to as many people as possible.” Dishes are made from scratch using whole, simple ingredients and are able to satisfy any dietary requirement, from gluten-free to vegan. Menu offerings include salads, soups, sandwiches, homestyle plates, pizzas and breakfast served all day. The coffeehouse will serve fresh-roasted Intelligentsia coffees, as well as teas, Freshens smoothies and crepes, a selection of pastries and gelato created by Notre Dame chefs. The design and atmosphere of the coffeehouse will be conducive to studying or socializing. In addition to the dining venues, Duncan Student Center will house a 500-seat ballroom, the Smith Family Sports Recreation Center, Career Services, meeting rooms and undergraduate and graduate student lounges. Originally published by Dennis Brown at news.nd.edu on April 06, 2017.